Twisting his nimble flow around skittering productions, ATL’s Flippa (fka Skippa Da Flippa) is an influential trap figure. Returning after a yearlong absence with a 13-track project packed with pearls of wisdom, Flippa shares Up To Something. Packed with twinkling trap productions from the likes of June Jamez, ILoveMuny, Iceberg Beatz, Yung Lan, and more, Flippa exudes an effortless pathos, his street stories enhanced by his gruff microphone presence. 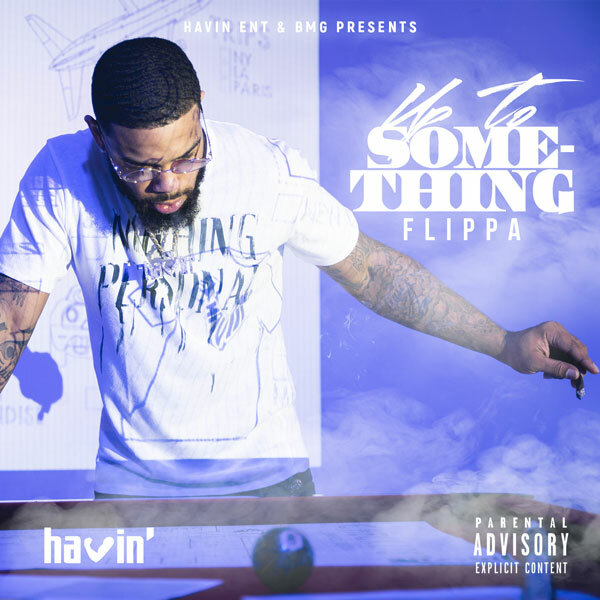 The follow-up to 2017’s Flippa McFadden 2, Up To Something is a reflective and triumphant effort, as the Florida-born rapper flashes a rapidfire triplet flow on “No N***a Like Me,” spins a candy-trap banger with the spritely “Want A Bag,” and shows his softer side and his charming singing voice on the for-the-ladies jam “Slide On Me.” Featuring an appearance from Sauce Havin, Up To Something arrives via Havin / BMG Rights Management. To accompany the release of Up To Something, Flippa shares the video for “Been Through It,” a highlight from the project. Ferociously attacking a haunting and minimal instrumental, marked by eerie church organ and subterranean bass, Flippa recounts the things he’s seen and the things he’s prepared to do to keep his lofty perch in the hood. In the video, Flippa returns to the site of a previous heist, digging up a briefcase full of cash before fleeing a pair of armed assailants. Premiered by HipHopSince1987, “Been Through It” is the second video from Up To Something, the rapper’s upcoming mixtape, following poolside clip for the spacey and triumphant “Don’t Play Me,” which has over 452k plays on YouTube. Born and raised in Palm Beach, Florida, the rapper formerly known as Skippa Da Flippa moved to Atlanta when he was 13 years old. Shortly after arriving in ATL, Flippa made the acquaintance of Quavo and Takeoff, two future members of Migos. Flippa, Quavo, Takeoff, and later Offset, spent their youths rapping in abandoned houses, developing a reputation as the best rappers in their neighborhood. Inspired by the success of Migos, Flippa began to think of his rapping more as a career than a hobby, dropping I’m Havin, his first project for Quality Control Records, in 2014. Featuring guest appearances from all three members of Migos and production from the likes of Murda Beatz and Cassius Jay, I’m Havin’ was an overnight success, leading to heavy regional buzz and a successful tour. In 2015, Migos and Flippa recorded a track about a dance move that Flippa pioneered a couple years earlier: the Dab. Performed by everyone from Cam Newton to Hillary Clinton, the Dab grew into a massive worldwide dance craze. Since then, Flippa’s profile continued to rise, appearing on Lil Yachty’s massive “Minnesota” in 2016 and growing his Spotify fanbase to over 200,000 monthly listeners. Over the past few years, he’s parlayed his Migos co-sign into a fruitful solo career, from releasing a string of mixtapes to dropping verses on hits like Lil Yachty’s “Minnesota (Remix),” Migos and Young Thug’s “Crime Stoppers,” and Jose Guapo’s “Run It Up.” Along with his high-profile features, Skippa has cultivated an impressive workflow, dropping five mixtapes in the last three years. From I’m Havin’ (which got almost 750,000 hits on Live Mixtapes upon release) and 2015’s Flippa McFadden, to last year’s I’m Havin’ 2 and I’m Tellin Ya, the latter featuring guest appearances from Young Thug, Juicy J and Trouble, Skippa’s grind has yet to show signs of slowing. His next project, Up To Something, comes out this fall.